Nedenfor er en oppsummering av treningsleiren til rugby union-herrene i Sussex, England i midten av august. Teksten er skrevet av Adriaan Botha. The team arrived at Gatwick International Airport on Wednesday afternoon where they were met by Cordery Coach to embark on the drive to the training facilities. Upon arrival, the team was created by both Ben and David and received their training gear for the duration of the camp before beginning the first session. The team’s philosophy has always been “being comfortable being uncomfortable” and this is a key principle of both Ben and David and this did not change during the camp; “we purposefully create a chaotic environment during on pitch training to replicate the imperfect nature of the game, and it is encouraging to see how the players are reacting to being pulled so far out of their comfort zones”. After the first session the team had dinner in the clubhouse of Heathfield and Waldron Rugby Union Football Club, whose facilities they would use for the duration of the camp. David is the head coach at Heathfield and Waldron and we would like to thank the club for their hospitality. After dinner the team travelled to Battle Abbey School which would be their accommodation for the duration of the camp. The second day of camp was by far the most intensive, which gave the players a look into the life of a professional rugby player. It started with a Strength and Conditioning session at Go:ver Training, run by the professional and dedicated David Gover, Clair Corney and Olly Stables. The session was split into segments, the first of which worked on mental toughness with Claire Corney. This session consisted of rowing to a certain pace as set by Claire and then some weighted sled pushes, with the weight increasing every 2 minutes fro 15 minutes. This was a true test of the team’s character as no one gave up. To add some spice to the session, Claire made it competitive with the eventual winners being Lars Thorkildsen, Stefan Dahle Ortiz, Mattias Lindqvist, Lasse Eri Marthinsen and Adriaan Botha with 116. This was followed by speed and explosiveness with Olly Stables. This session was a circuit style workout consisting of Med Ball Wall Throws, 1 leg box lunges and Elastic Band jumps. This would not be the last time the team would meet Olly as they were set to play against him on the Saturday. The strength component was led by the man himself David Gover! This session was all about building up to a 1 Max Rep Front Squat and Tobias Carcary Nygaard came out with an impressive 130kg. This was particularly tough after running through the previous sessions but the team is starting to get comfortable being uncomfortable. Lastly, David led a conditioning session which combined principles from the previous sessions. All in all it was a tough start to the day, but all the players saw the benefits. The team finished the day with 2 field sessions at Heathfield and Waldron Rugby Union Football Club, the last of which was an opposed session against the club’s first team. Once again, the day was a tough and fatiguing one, but the team drew on what they learnt at Go:ver Training and came together. Friday was a lighter day, with the team having the morning off. Some took this oppurtunity to sleep in and enjoy a long hot bath to rest the muscles, whilst others ventured into Hastings for a soft serve by the sea. The team enjoyed a light field session in the afternoon followed by a team dinner in Battle. Saturday was match day with two forty-minute trial matches arranged against Heathfield and Waldron Rugby Union Football Club (London & SE Division – London 2 South East) and Sudbury Rugby Union Football Club (London & SE Division – London 1 North), with the latter being coached by Ben himself. Norway were to start the day off with a 40 minute trial against Sudbury, and you could tell that both teams shared the same coach with the same attacking philosophy. The teams played with the same shapes and had the same principles in attack and defence, with Sudbury being the better drilled side on the day. Norway were valiant in both attack and defence, but coming off a long preseason, Sudbury proved to be the fitter side scoring tries through some scintillating rugby and support play. The second of Norway’s matches came agains the hosts Heathfield and Waldron, and this would prove to be a tighter affair. Heathfield came out of the blocks scoring two quick tries, but as the game progressed so did Norway. The team showed great character and came back scoring 2 of their own, with a brilliant individual effort from flyhallf Stefan Dahle Ortiz being the pick of the day. None of this, however, was possible without the quick clean ball being provided by the forwards and the hard work being done off the ball by the support players. It was in these moments, when the chips were down that the leadership and commeraderie came out, which is summed up by Scully; “the team are buying in to our philosophy that whether in attack or defence we want a team of players that are comfortable making their own decisions and adapting their play according to the problem in front of them”. All in all Norway travelled to England for a 5 day training camp taking with them a young squad with many new faces and although the results may not have gone their way, the players who attended learnt a lot not only about the rugby Ben and David want to play, but also a lot about themselves. “We still have plenty of work to do to get the team to where we would like them to be, as well as finding new talent and growing the training squad, but if the boys continue to apply themselves with the attitude they have demonstrated so far the squad will go from strength to strength” says Scully. This team has not yet reached their potential and with more new and old faces joining an already experienced squad, this team is sure to go places. 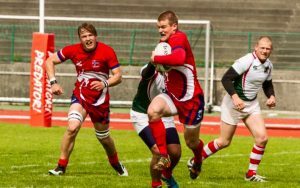 In Norway, rugby is a minority sport with players and coaches paying their own way and taking time of work to attend training camps and away fixtures. It is part due to this that some players were unable to attend as they were unable to get additional time of work to play the sport they love. For this reason, the players have created a crowdfunding campaign to help those in need of financial aid. For more information visit https://sponsor.me/rugbylandslaget . Any contribution, big or small will help the team reach their goals! The players and coaching staff would like to thank Heathfield and Waldron Rugby Union Football Club and Battle Abbey School for their hospitality over the 5 days as well as Cordery Coach for providing the team with transport to and from the Airport, accommodation and playing facilities. They would also like to thank the professional and knowledgable staff at Go:ver Training and the players and coaching staff from Sudbury Rugby Union Football Club for making the journey over on Saturday. Last but not least, the players would like to thank all those involved in arranging the camp from the President of the Norwegian Rugby Federation and the team Manager as well as those already mentioned above. I anledning det polske rugbyforbundets 60-årsjubileum, skal det arrangeres en vennskapskamp mellom Polen og et lag med spillere fra hele Europa. 15-mannskampen mellom Polen og Europa spilles lørdag 9. september i Lodz, Polen. På Europa-laget er Norge representert med Lars Thorkildsen fra Horten RK, Tobias Carcary Nygaard fra NTNUI og Aleksander Næss-Clarke fra Horten RK. 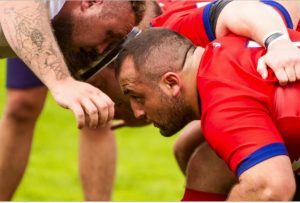 Norges rugbyforbund ønsker dere lykke til! «We have chosen to offer this opportunity to Aleks Neass-Clarke (Horten RK), Tobias Nygaard (NTNUI RK) and Lars Thorkildsen (Horten RK) as they have not only shown great dedication in developing themselves in to players that are integral to the national team at such a young age (21, 20 and 19 respectively); but we also believe that they have the right characters to be seen as role models and to help spread the wonderful game of rugby to the young and upcoming generation. We are extremely happy to learn that all three have been selected, and wish them good luck! Aleks has shown himself to be equally comfortable playing on the wing or at full back. With elusive footwork and lightening top end speed, Aleks poses an attacking threat whenever he gets the ball in open space against a broken defence. His leadership qualities and his confidence to direct the players in front of him make him a great defensive general from full back and, when it is needed, his bravery in the tackle shows that rugby can be a game for all sizes if you have the heart and desire. Tobias is a real power house of an athlete, who prefers his performances to do the talking. A player who clearly looks after himself physically, Tobias has the strength to go through the defence as well as the pace to go round it; as demonstrated by his multiple caps for the National 7’s team. Friendly and talkative off the pitch and physical on it, Tobias shows despite being a tough sport Rugby is played by gentlemen. Norge reiser til Danmark for å spille landskamp 22. oktober i Odense. Kampen er det andre i Rugby Europe Championship Conference 2 North for xv-rugby. Norge spilte første kamp i Rugby Europe Championship Conference 2 North på Bislett 8. oktober. Den gangen gikk Norge seirende ut av oppgjøret 41-31. Etter tap borte mor Tyrkia forrige helg, er det norsk XV landslaget sugne på revansje. Førstkommende lørdag kl 15:00 på den internasjonale skole i Stavanger er det klart for returoppgjør. Mer informasjon om kampen finner dere her.